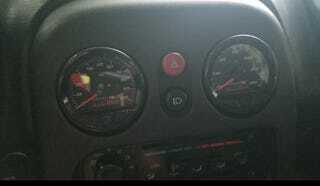 Oil pressure and water temp gauge are in, wired up (thanks StudyStudyStudy!) and the oil pressure at least is connected. But... THEY’RE DIFFERENT COLORS. I can’t handle that. Pretty sure I’m going to have to cut open the sealed oil pressure gauge and swap in some blue LEDs. Hopefully that’s easy. This is something that will 100% bug the hell out of me, forever. It’s worse than the currently mismatched seats (which are plenty bad enough, thank you very much). Problem two - The sandwich plate I used added an extra inch to the oil filter, which means I can no longer use the 1" longer oversize oil filters (which are in stock everywhere) and I have to start using the OEM size filters (which are tough to find, and local shops don’t realize there’s a difference). Should have thought of that I guess. Now I have 12 oil filters I can’t use, and 0 that I can. Rats. Problem three - In my infinite wisdom, I oriented the oil pressure sender at the top of the sandwich plate. The sender is short and doesn’t extend past the walls of the sandwich plate. I’m pretty sure that means my oil pressure reading are completely useless right now, due to gravity and such. Shows 30-40psi in neutral, and climbs with rpm’s at the same rate as my tach needle. Sigh. Can’t fix the orientation of the sender without draining the oil. Guess it will be a month or so before I get that. I will say that a white filter is infinitely better than a black one. Now I can actually see it. Unsure about the nut though. Do people actually tighten these so much that they have trouble removing them..? the specs sheet clearly states “blue backlighting” and in all product videos/pictures the light is blue. Strange... I emailed Longacre, who makes the gauges. Also found out that their service department is twenty miles away from me. Smaaaaaaall world.